The “Blog” of “Unnecessary” Quotation Marks: oooh, "permit parking only," got it. My only explanation for this sign is that it is not just a euphemism, but an entire conceit of euphemism. For what, I am not sure. Thanks, Richard. I can picture the employees of the lot kicking, or "booting" my car if i park there without a "permit". They seem to be deriving some devilish glee from doing so. Scholars of euphemism will be able to produce a PhD out of this one. When I read the sign, I imagined the employee's snickering at anyone who believed it~! it's not even a parking lot at all!! OK, in addition to the quotes, what's up with the "your vehicle may b ..." would printing the second half of the word be throw them vastly over budget? I had the same thought as John--they insisted on putting all the UQs in there, but couldn't be bothered with that one "e" to make the word "be" complete? And if this lot is for permit parking only on holidays and weekends, does that mean I can park there with no permit for the rest of the week? Actually, the phrases within the quotations are possibly taken directly from the written law. If this is the case then the sign is grammatically correct, since it's actually quoting something. Not to ruin the joke or anything. 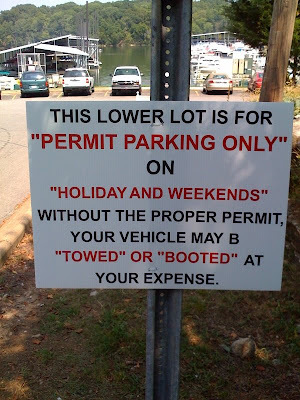 "Towed" and "booted" are practically sexual. Fabulous. We can't forget the lonely B sitting there, without its E.